One of the most popular — and controversial — trades in the stock market is showing no signs of slowing. An exchange-traded note betting that US stocks will essentially sit still for the next month saw record trading volume of $US3.3 billion on Thursday, June 22, according to according to Macro Risk Advisors (MRA), a firm that arranges volatility trades. The surge in anti-volatility trading comes at a time when opposing bets on increased price swings are staying subdued. 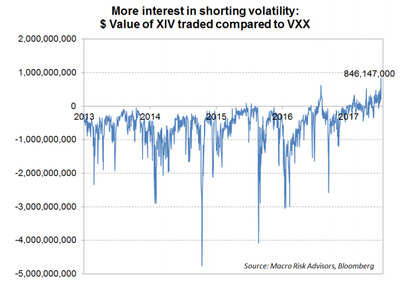 As a result, the volume spike also marked an all-time high for the note relative to a long-volatility instrument that’s usually more popular. Macro Risk AdvisorsVolume in a short-volatility ETN just hit a daily record versus a product betting on more price swings. MRA attributes the instrument’s spiking popularity to the participation of mum and pop investors. Representing a more inexperienced class of trader, the group may not fully comprehend what they’re betting on, and may be blind to the associated risks, the firm says. The trend is “perhaps pointing to the growing interest in shorting volatility among retail and others who are not specialists in volatility trading,” Pravit Chintawongvanich, the head of derivatives strategy at MRA, wrote in client note on Wednesday. 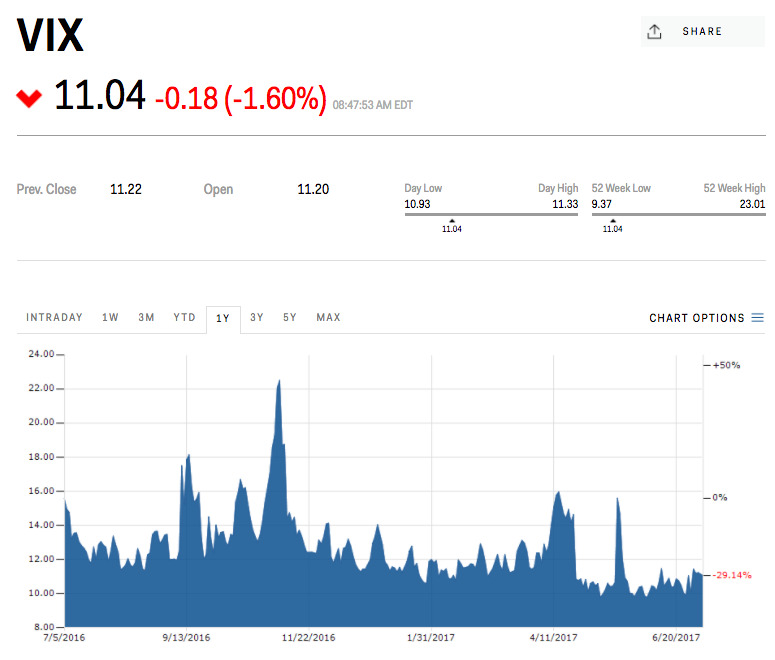 Ultimately, a bet against the CBOE Volatility Index, or VIX, is a wager on a continuation of the ongoing low-volatility environment — one that’s left some market sceptics scratching their heads, while creating an investment landscape somewhat devoid of alternative money-making possibilities. One of the most vocal opponents of the short-volatility trade has been JPMorgan quant guru Marko Kolanovic. While conditions may seem innocuous at present time, a sharp, unexpected shift in the stock market could result in a painful unwind for investors betting on placidity, says Kolanovic, the firm’s global head of macro quantitative and derivatives strategy. Bank of America Merrill Lynch has also warned against investors getting too comfortable betting against volatility. While price swings across all asset classes have slipped to the lowest level since 2014, the firm finds that a separate measure of market fragility has been climbing steadily over the past six months. But for the time being, the VIX seems more than willing to cooperate with the bets and wishes of anti-volatility crusaders. The so-called stock market fear gauge sat at 11.18 at the end of last week, about 40% below its average for the eight-year bull market. Markets InsiderThe VIX is about 40% below its bull market average.